Today. Dad describes H.M.S. Ocean history. Thus I have outlined the general picture of the operation of a squadron and as I say I joined 805 when it was ashore at Hal Far. After a few days we were to embark on HMS Ocean. First, the ship came into Marsachlok Bay and half the ratings were transferred by boat to the ship. Sam Turner went with them whilst I remained at Hal Far with the other half. I had to see that the pilots were equipped with their parachutes. Meanwhile Ocean had sailed. The squadron aircraft took off from Hal Far and flew out to and landed on the ship. The ship then returned to Marachlok and then the other half of the ratings and stores were transferred by boat to the ship. This entire manoeuvre took place over a period of only a few hours. When we were aboard, Ocean sailed. HMS Ocean, a light fleet carrier, was laid down at Alexander Stephen’s yard Govan on the Clyde in November 1942. Building took 2 years and she was launched in July 1944. Then followed a fitting out period and sea trials until she was eventually commissioned in August 1945 just as World War 2 ended. Her full weight was 18 400 tons with a length of 695 feet and a beam of 80 feet. Her draught was 23 feet with a speed of 25 knots (some 29 mph) Her main armament of anti aircraft guns was situated in sponsons, give on each side extending just below the level of the flight deck. 816 Squadron with 12 Fairey Firefly RR1 which is addition to 4 x 20mm cannon in the wings carried 2 x 10001b bombs or 16 x 3 rich rocket projectiles. These aircraft had a maximum speed of 335 knots but with a cruising speed of 191 knots had an endurance of 6 hours. The crew consisted of one pilot and one observer. The other squadron 805 consisted of 12 Seafire FXV11 (the Naval equivalent of the Spitfire) with an all up weight of 3 and a half tons the weapons of which consisted of 2 x 20mm cannon and 4 x 303 Browning machine guns in the wings. The length of a Seafire was 32 feet wing span 36 feet and height 10 feet. Top speed 333 knots, cruising speed 290 knots. Endurance depended on rate of speed but at best would be about 90 minutes. 816 Squadron’s purpose was reconnaissance and attack of sea on land targets. 805’s was air defence of the parent ship. A few months after she was commissioned HMS Ocean was involved in a historic event when in December 1945 a Vampire Jet piloted by Lt Commander E Brown was the first true jet aircraft to be landed on a ship at sea. 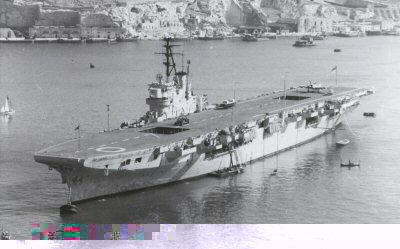 Later in December the ship set sail for the Mediterranean and in the early months of 1946 did trials for night flying and became proficient as the only carrier in the Fleet able to operate around the clock night flying. After a short period in the Mediterranean she returned to England 892 Hellcat Squadron was replaced by 805 Seafire Squadron under Lt Commander Peter Hutton and the ship set sail again for the Mediterranean. The ship joined the Mediterranean Fleet in July 1946. The Ocean with her sister carrier HMS Triumph formed the 20th Carrier Air Group and were the only two Royal Navy carriers in the Mediterranean Fleet in 1946 and 1947. The Air Admiral was Rear Admiral Denis Boyd who had been skipper of the HMS Illustrious at the battle of Taranto. He flew his flag in the Triumph and as a consequence it was felt by the crew of our ship that the Triumph got all the soft options. However there was no animosity between the two and on the few occasions when we were in company there was just a friendly rivalry. In the Royal Navy, not just in the Mediterranean Fleet, but in every fleet and indeed in every port there was rivalry between ships. There was pride in one’s ship from the Captain down to the most junior crew member so that everyone strived to do better than any other ship. Unfortunately when ships were in port and crews met in bars taunts would be exchanged and fortified with drinks, it was frequent for fights to result. Then along would come a Naval Patrol and those arrested would be returned to the ship to receive the Captain’s punishment. This did not occur with the two carriers because it was rare for us to work in company. Often the Triumph was operating in the Western Med whilst we operated in the Eastern Med. In October 1946 Ocean was in Greek waters when two British destroyers the Volege and the Saumarey were mined in the Corfu channel between Corfu and Albania. Albania had illegally mined the Channel and Saumarey was struck first and then Volege was struck when going to her aid. Between the two crews 44 were killed, 31 of whom were never recovered and many others from both crews suffered serious injuries. Ocean was the nearest ship with substantial medical facilities including a hospital and several surgeons. She hurried to the scene and took on board many of the injured. After three days patrolling the area in anticipation of further incidents with the Albanians she was returned to Malta to transfer her casualties to hospital in Malta before resuming normal duties. In January 1947 Ocean became flagship to Flag Officer Air Mediterranean Vice-Admiral Sir C J Harcourt and spent a further period cruising before returning once more to Malta where I joined her. My dad was on the Ocean, Leading hand 6 aircraft to look after, he was in Malta in 45-46.On return to the uk she stopped in the middle of the Bay of Biscay and all lend lease, aircraft and spares were pushed over the round down, broke his heart. Before this he was on HMS Ravager, deck landing training off Ailsa Craig, the”wonderful Clyde and Macrihanish.Dave. My Dad Bill (Will) Edwards was also on HMS Ocean around this time 1945/46. I remember him saying he was an aircraft handler aboard the carrier and spend the best part of a year in Malta. He was mates with a guy called Geoff. I wonder if there are any people out there from the crew who might have known Dad? My father Joe served in 805 Squadron HMS Ocean 1944-1946 as an able seaman and I have a picture of the Squadron on the deck of the carrier in Portsmouth dockyard. I would love to hear from anyone who may have served with my father or have any information about him and his colleagues. Sadly Dad died suddenly in 1979 aged just 52 and my brother and I would like to find out more about his time in the Navy. Whilst talking to my dad about the war today, established he was on HMS Ocean in October 1946 as a 16 year old telegraphist and witnessed the Corfu Channel incident. He is now 90 and had wondered if he had imagined what had happened. Great to investigate and clarify this memory which we can now tell his grandchildren. Great respect to him and everyone else involved. Sorry and sad for the loss of life and injured. Have got photos if any one is interested, not of the incident but of him on the ship with the aircraft.